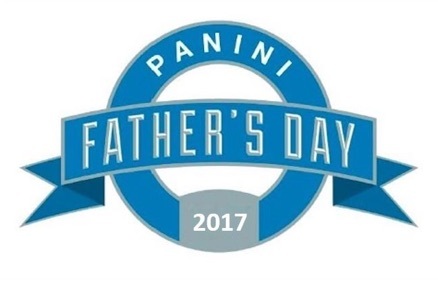 Although the promotional product in honor of dad has become an annual tradition, the 2017 Panini Father's Day checklist tweaks the format with two different pack options. This includes NFL packs with only football players, and multi-sport packs that feature most of the other sports under the Panini banner. Packs are awarded at participating hobby card shops based on certain Panini box purchases. Collectors can obtain the incentive cards during Father's Day weekend, starting Friday, June 16, 2017. Leading off, the 2017 Panini Father's Day NFL packs naturally focus on top football players with a base set highlighted by serial numbered rookies from the 2017 draft class. There are also limited Autographs and Memorabilia cards as an added chase element. The football packs are earned by purchases of 2016 and 2017 Panini Football products. Ranging from one to five packs per box, refer to your LCS for specific details on the total packs awarded for each box you buy. Covering the rest of the Panini sports, including baseball, basketball, NASCAR and soccer, the Multi-Sport set matches the football version with its own base set, numbered rookies, Autographs and Memorabilia cards. These packs are earned from a wider variety of box purchases, including various 2016-17 Basketball, 2017 Baseball, 2017 Racing and 2017 Soccer products. The 2017 Panini Father's Day Multi-Sport packs are also distributed based on the product purchased and some tie into other Panini promotional packs. Shop for 2017 Panini Father's Day cards on eBay.